The FreqOut isn’t the first pedal to attempt feedback emulation, but it is the only one to nail it, and that makes it a must-buy in our book. Feedback is the telltale sign of a guitar running at full tilt into a real, raging amp. 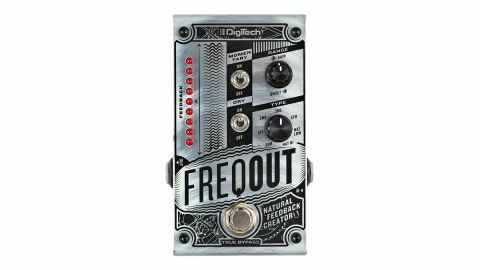 Yet it’s not something that can be easily replicated - until DigiTech dropped the FreqOut, which utilises a combination of pitch-shifting and reversed feedback suppression tech to capture the wails beloved by the likes of Hendrix, Cobain and Satriani. There are two modes of operation: momentary, which adds feedback when the footswitch is held; and latching, which uses your pick attack to automatically trigger the feedback. These sounds are controlled via Gain (feedback level) and Onset - the time it takes to reach max ’back, as indicated by the left-hand row of LEDs. A type control adjusts the harmonic frequency of the sound, going from a cab-rumbling sub to a two-octave-plus 5th harmonic squeal. The natural hi/lo settings, meanwhile, offer the full range of frequencies, making the feedback more likely to transition between them. It can be unpredictable, but that only adds to the realism. What’s more, a dry switch kills your guitar signal, leaving only the feedback: slide between notes and you’ve got a thoroughly usable theremin/EBow impersonation. It’s hard to believe the sounds you can coax from the FreqOut aren’t real feedback, until you remember you’re playing a clean tone through headphones - this pedal makes the impossible possible, especially for anyone seeking live-in-the-room sounds from plug-ins.